Currently, there is complete road construction taking place on the road right in front of our church. We CANNOT use the road because it is shut down. It forces us to take an entirely different route to get there. But, the work is going rather quickly and is only anticipated to take about 120 days. The project is taking place in 2 phases – the west side and the east side. Currently, the west side is shut down, but the east side is open. So far, the western path is right on schedule. Each side is scheduled to take up to 60 days to complete. The intention is to widen the road with a turn lane and a walk\bike path parallel to the road. No doubt it will be much better than the small 2-lane chip&seal road we have now. If I did not want this new construction to take place for whatever reason, I really have no control over it. It WILL take place, with or without my cooperation. I cannot control this inconvenience. Change is NEVER easy. Unfortunately, most of the time change comes at the expense (and rejection) of the past. It doesn’t have to be that way. Our past does NOT have to be rejected. It is our past that has gotten us to where we are today. We may not like some things about our past (Lord knows I have my share of those “things”), but still it was that smooth or rocky or hilly or broken path that brought you to where you are now. When it comes to the roadway, the surface must be completely redone, but the pathway of the road is basically the same. The purpose of God’s reconstruction in your life is NOT just to inconvenience you, but to provide you a much better path to get you to where He has planned for you to be. ***NOTE: I am not referring to taking a easier path (in contrast to the narrow path VS the broad path mentioned in the Bible.) God simply wants to provide everything you need. 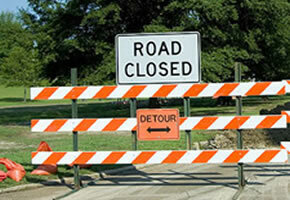 All of us will be faced with a detour due to construction at certain points in our lives. They can be God-ordained, self-inflicted, or other external delays. Reminder yourself that these are temporary delays. Many times we actually have to use an entirely different daily route to get to where we need to be. It IS an inconvenience right now, but the detour is NOT necessarily because it’s over for you. If the road is shut down, you either have to wait until the path is reopened or take the detour. God may be simply RESURFACING (reminding you) of the path He has planned for your life. If God wants to resurface my path, HAVE AT IT! It is simply a temporary re-route or a complete stopping. Yes, sometimes He needs to STOP US from going any further. He has his reasons. I plan to let Him work out the details of my life…my role is to simply trust Him and wait until the sign turns from STOP to SLOW to END ROAD WORK. God has an INCREDIBLE plan for your life. Don’t reject the re-route or the construction He has planned. I promise, when He’s done, you’ll love it. It’s a path to your divine destiny. When they get done with the construction, it will be so much better for us. Can’t wait till God brings the kind of exposure to our church that He has planned (and in His timing). Previous Previous post: Are you committing Emotional\Relational Suicide?